Hopefully this is the last time I'll have to update Utica Avenue. Great work, the lighting matches too! Incredibly realistic! 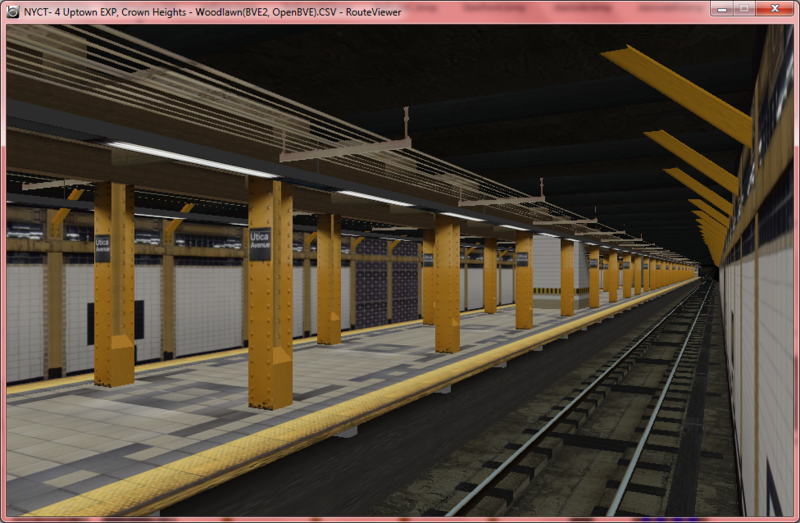 Perhaps the most realistic NYCS station I ever seen in development for openBVE. Great work! AWESOME! To quote Knuckles of Thesupersubwaybros, "TOO STRONG!" Of course the Flushing-bound 7 isn't detailed. That route was released way back in 2000 or '01, when neither the BVE software, nor most medium range computers for that matter, were able to handle the graphics-intensive routes of today. Yes, line 7 is fantastic (http://www.youtube.com/watch?v=4533ZGZp7Y4#)! When are we expecting the Manhattan bound 7 to come out? I don't know, but I hope that the devs keep us posted. Anything new for May 2014? Work is moving along, albeit slowly. Keep in mind that a lot of developers (myself included) have college finals and/or APs and/or regents tests that we have to focus on. Work will speed up in a couple weeks.